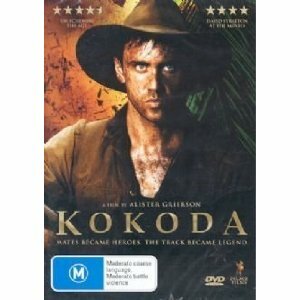 Kokoda 39th Battalion is an Australian movie by Alister Grierson and tells another story that took place in the Pacific during WWII. Only this time we don´t watch Americans fight for the Australians (as they do, amongst oher things, in the miniseries The Pacific), but the Australians themselves. The Kokoda trail on Papua New Guinea is the main trail that leads directly to Port Moresby. By means of this trail the Japanese were planning to arrive at Port Moresby and from there an invasion of Australia would have been easy. Obviously the Australians did everything to prevent this. The 39th battalion who is in the center of this movie was essentially a battalion of untrained volunteers. The central story focuses on two brothers who joined this battalion together. The opening of the movie shows us a sequence of still lives that are very beautiful. Pictures of fauna and flora of the island. After that we see what has to be interpreted as premonition like dream of Jack, one of the two brothers. This is somewhat an exaggeration of what the terrain was like. Same as in episode 4 of The Pacific there is a constant rain, and the terrain gets muddier and muddier. Jack slips and is almost drowning in mud. In the end he looks like some almost amphibian prehistoric creature. Those first ten minutes make you believe you might watch a film like The Thin Red Line with a lot of flashback elements, daydreams but that is, as you soon realise, not the case. From that moment on Kokoda turns into Hamburger Hill, meaning heavy jungle infantry combat. The men are surrounded by Japanese soldiers whose camouflage is so much more efficient than their own, whose fighting experience is outstanding, and whose cruelty, as the movie wants to make us believe, is beyond imagination. This was one of the movies that made me think again and again: Why war? Why did that happen? Why did it have to happen. The efforts of the Australians seem so futile, that even though they won in the end, there is nothing noble in all this. It´s just horrible and hard to watch. I first thought that this was an average movie but the overall atmosphere is so intense, the desperate fight of these badly trained men is so well depicted that I think it´s quite a good movie that I would recommend you´d watch. And, most important, the pictures of the dense forest and the instances of cruelty in the middle of the jungle aren´t easily forgotten and stay in your mind long after you´ve watched it. Yes, it´s biased, the Japanese are shown as beastly monsters but still. Furthermore it tells a quite soulful story of the deep bond between brothers.